Online chatting has been redefined with the video chat technology and more and more webcams are taking birth introducing new and vast technology, well but side by side webcams are somewhat expensive and can do only one task live streaming you to your friends and family members. Well if you wanna save your money and side by side want the same webcam experience, you can convert your mobile camera into PC webcam with small apps and tools easily. Well we have three best options that work universally on every platform, so we are going to use Smartcam as our first source, Mobiola web camera and the second source and the third one is specifically for android that’s iP webcam. 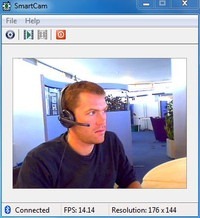 Smartcam Package simply provides an easy to install option for your all devices, Symbian, Android, iPhone and connect them as a webcam for your computer. Download Smartcam Package and extract it in your PC, it’s a simple zip package so just right click and choose extract. Now it contains a .exe file for your computer and applications for your android device, Symbian device and iPhone. You can use the one in package or you can download them online for newer versions. Now after you have installed on both devices just fire it up using Bluetooth or USB connectivity and follow instructions and you will be live streaming your mobile camera video as PC webcam. Mobiola Web camera is available for iOS Devices, Blackberry, Symbian but its not free and you have to pay little cost to get that app running. 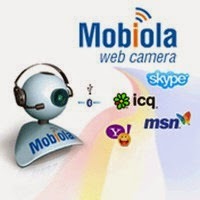 Purchase Mobiola Web Camera software or download as trial version. Now just install app on your device after purchasing their device application. That’s it now follow instructions and start chatting with your friends. 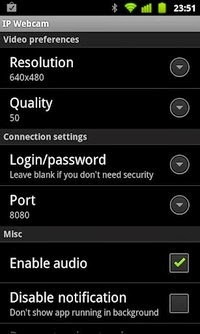 iP Webcam for Android is simple application for converting your Android Device into a wireless PC Webcam. This free application can be installed right into your PC and can used just by a simple IP (internet protocol address). Download iP Webcam Android App. Install the application on your phone and connect to the same Wi-Fi network connected to your PC. Now just follow the instruction on your app and you will be able to connect your device camera with your PC and use it as a webcam. So now these were the three easy options for converting your device camera into a simple and free PC webcam. So no investment but still the same fun of video chatting is continued. Have fun and do comment.